And now we find ourselves on Monday, November 8, 2010. It’s my friend Maurice’s birthday and also Scott Williams birthday. Both of them are 42 years old today. I haven’t seen Maurice since I saw Beck with Julio at Radio City on Valentine’s Day in 1999. Another world ago. And I haven’t seen Scott Williams since the early part of this century at his mother’s wake. I might have seen him once since he may have been a police officer being interviewed on the television a few years ago. I sent a Facebook message to Maurice and sent him birthday wishes. Alas I have no information regarding Scott so if he searches for himself, the grandson of Nanny Williams, best wishes Scott. Yesterday was a busy day. Spent part of the day with my brother Frank, his wife Elaine, their daughters Meghan and Corinne and Meghan’s husband Rob. Meghan ran the New York City marathon last year and this year it was Rob’s turn. I met up with Frank, Elaine and Corinne in front of Stack’s pancake house. Meghan was in the city already, cheering Rob on. We waited a good while to get some pancakes and after 20 minutes we decided to head out sans pancakes. We opted for bagels at Panera Bread further down Washington Street, closer to the Path train. Not much of a wait to get on a train. From the 33rd Street Path train we were on the R train heading to 5th Avenue, the Plaza Hotel. From there we could head into Central Park and wait for Rob to run by. We walked up into the park, and at one point we were in the roadway. We decided to step over the 2 foot wooden barrier, first went Elaine, then Corinne, and me with Frank bringing up the rear. Unfortunately Frank lost his balance and took a tumble backwards. I grabbed his arm but I was no match for gravity. He landed on his back and boinked his head. I didn’t think it was so bad but there were a few people around who saw him hit his head and were concerned. There were also a number of Emergency Service Technicians (EMT) nearby and a few of them made their way over. They asked Frank a couple of questions, do you know where you are? What year is this? And he answered correctly. Speedy pulse and all that, caused them to sit with him for a while. It would have been worse I think, if I wasn’t grabbing Frank’s arm, he would have fallen a lot faster and really did some damage to his skull. The roadway was intact by the way. We made our way to the other side of the park, trying to connect with Rob, post finish line. After some waiting we saw Meghan and Rob coming towards us, Rob looking in sore shape. 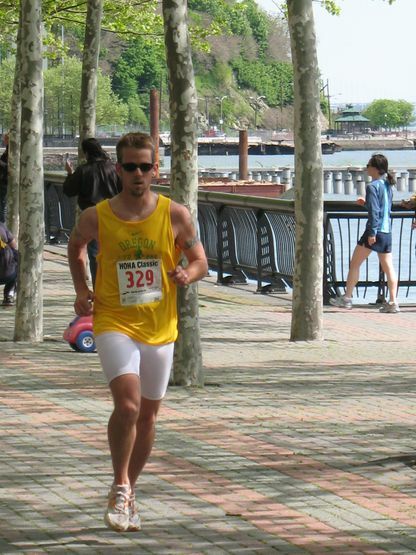 Despite being the #1 track coach in New Jersey, he was wasted from the marathon, his time being 3:28, swearing that it was his first and last marathon. We met up with Rob’s parents who dutifully got their car and drove Rob & Meghan home, leaving us to get the subway and the Path train back to Hoboken. Frank was OK, everyone was tired. 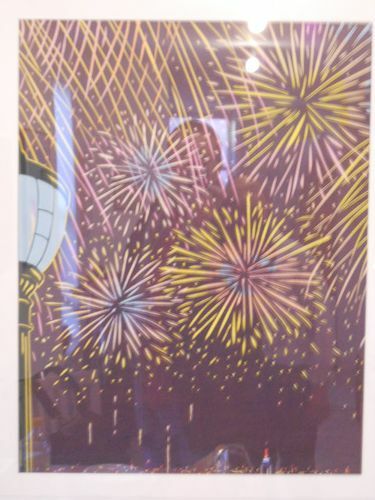 I made my way to the Hoboken Artist Studio Tour, but decided to only see Hiro Takeshita. He’s been living in my old apartment building at 2nd and Madison Streets for the past 26 years. It was nice to see him as he showed me his latest works as well as things from the past. By that time I was tired and also needed to do some grocery shopping, so after a half hour I headed out. Hiro did say that he sold a few pieces and that it was very crowded the day before, and that was good to hear. I do enjoy his work and he’s a genuinely nice guy. Came home, made dinner and talked with Frank to see if he was alright. He was and we rehashed things from earlier in the day and earlier in our lives. A few minutes after that, a phone call from Annemarie, more chatting. Bill came home during the call and for some reason, was sitting in the kitchen not making a sound. After I got off the phone with Anne, I went over to Bill who was out of sorts. He had gone to see a friend sing in a cabaret, and since there was a 2 drink minimum he had 2 Absolut and cranberry cocktails, then after the show went to the gym where he promptly over did it. He had a ringing in his ears, was dehydrated and generally disoriented. I brought him down to earth somewhat and kept a close eye on him throughout the night. He rarely drinks and this is why. Sleep followed after a while, after Boardwalk Empire and Bored to Death. Bill went first and I was asleep an hour later. I’ve realized lately that I have a job. Not the job I want, but the job I got. So I’m likely going to take a break from frantically looking for something new. Perhaps next year. It’s just as well since Don came to the cigar shop on his day off, to give his 2 weeks notice. So now, behind Marcus and Calvin, I will be the longest serving employee. Into my 6th month. Sean is a part timer so he doesn’t count. This entry was posted in Love Love Love and tagged Bill, Cigar Shop, Frank, Garfield Contingent on November 9, 2010 by johnozed. 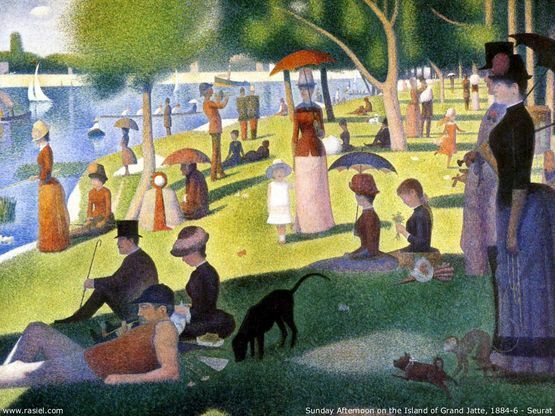 Well I just got back from seeing Sunday in the Park with George, a musical by Stephen Sondheim based upon Georges Seurat’s painting ‘A Sunday Afternoon on the Island of La Grande Jatte’. I enjoyed it, I enjoy most if not all of Sondheim’s work. There’s usually a challenge in his work. It was an excellent production though in the first act I suffered from heavy eyelids. The sound was not as good as I had hoped and with the uncomfortable seats (if you’re over 5’5” theater seats on Broadway can be painful) I found myself a bit drowsy for a millisecond or two. Not Sondheim’s fault. We all enjoyed it, my brother Frank, his wife Elaine and their daughters Meghan and Corinne, though Frank and myself probably enjoyed it most. 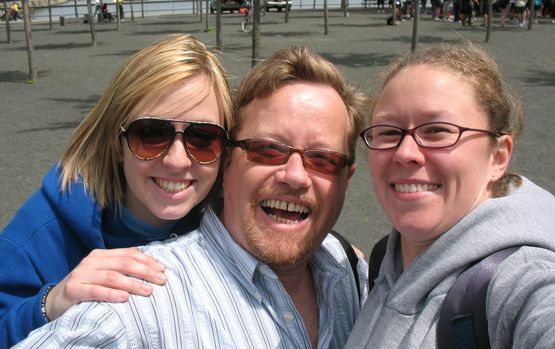 He’s the one who got me into Sondheim over 20 years ago with a trip to see Sweeney Todd performed by the New York City Opera at Lincoln Center. For me, today’s play all came together at the very end, the very last note, the last words in the play, which was basically a gasp from present day George. The effects on stage were incredible and couldn’t be done when the play premiered in the 1980’s. A good use of digital imagery that certainly took one’s breath away. Tonight the play is up for a few Tony awards, and there is fierce competition. I might have a reason to actually watch the Tony Awards tonight. I know Bill wants to see Whoopi Goldberg hosting so it all seems set. I’ve already ordered the soundtrack to the show online, and plan to contact the Roundabout Theater Company to see if they have the ‘usher program’ that they had 10 years ago when I saw Cabaret for free. It was a good deal, wear black trousers, a white dress shirt and you tell theater goers to wait until an usher arrives to seat them. I asked one of the ushers today about the program and she had no idea what I was talking about. The play closes June 29 so I’d better get on the ball tomorrow. People had better turn off their cellphones before a Broadway show. I don’t understand how stupid and rude some people can be. And that goes for texting as well. It happened a few times during this afternoon’s performance. On the way into the city on the bus, I got a phone call from Elaine. They had actually gotten to the theater before I did, which is a switch since someone in the Garfield contingent usually holds back everyone causing chronic lateness. I said into the phone, ‘since when are you early?’ This got a chuckle from a passenger next to me. As we crawled through the tunnel he mentioned what a funny thing it was that I had said. We started talking about music and politics. It turned out his name was Ray Robinson, son of legendary boxer, Sugar Ray Robinson. He was heading in to see his wife and kids. I confessed my anxiety about being late for the play as well as being late for some people who are generally always late. He was reassuring and I told him that it was nice chatting with him, but once the doors of the bus open I would be gone. And gone I was, running through the bus terminal and hopping into a taxi to drive up Eighth Avenue for 12 blocks. I made it and found the four of them outside the theater. I definitely want to see this play again and hope I can for free. This entry was posted in the day after yesterday and tagged Garfield Contingent, Georges Seurat, Ray Robinson Jr., Stephen Sondheim on June 15, 2008 by johnozed. A very mellow day. Presently watching a documentary on the Hippies, narrated by Peter Coyote, former Digger and the go to guy for narration duties for this type of thing. It’s not the ‘everything was great’ documentary, it’s more like “look it had it’s dark side.” I’m not really paying much attention to it. It’s rather bland and it’s nothing I hadn’t heard before. Last night was very quiet, didn’t do much of anything. Juan called at 11:30 wanting to go out, and I told him that I would need a little more time to prepare, and Saturday Night Live had started, so I was basically in for the night. Fifteen years, while living in Weehawken I would wait until midnight on Saturday nights, phone in my unemployment claim then walk down to McSwells where I wouldn’t leave until after closing and somehow make it home usually by taxi, or depending on the kindness of strangers. Now, I’d need enough notice, a disco nap and probably some Red Bull just to get me out the door. Juan did go out, solo and was the belle of the ball from what he said. I probably would have maintained my persona non grata status. 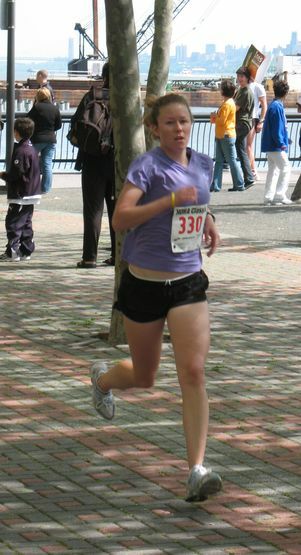 Just as well that I didn’t go out since my niece Meghan and her husband Rob were participating a 5 kilometer run in Hoboken. I found out last night with Meghan calling me. Last year she called me an hour before the race and I went, but this year I was able to prepare myself and have coffee and breakfast beforehand. This year, brother Frank, his wife Elaine and their other daughter Cori were able to make it. They called, wanting to come over to use the bathroom. I asked them where they were and they were closer to the train station so I steered them there and got myself together. I met up with them on the street, Frank jonesing for an Egg McMuffin so it was off to McDonald’s for him while Elaine and Cori and I waited outside. Various families running off to early brunches and breakfasts for Mother’s Day, including McDonald’s. WE walked over to the river where there was a mass of runners waiting to start running. A couple of hundred I would say. They were soon off vanishing into the distance. 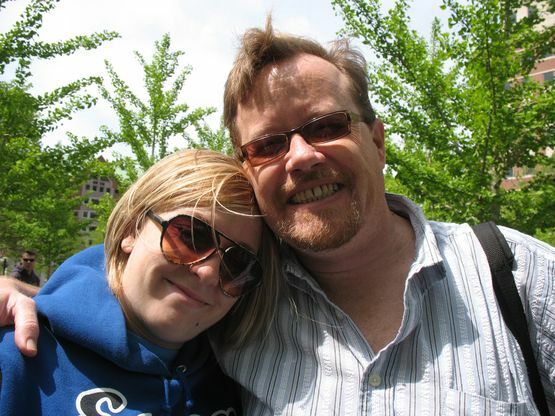 We sat on benches where Frank ate what turned out to be cinnamon buns, not an Egg McMuffin. The runners made their way back, Rob coming in 10th place for men and Meghan coming in 2nd for women. 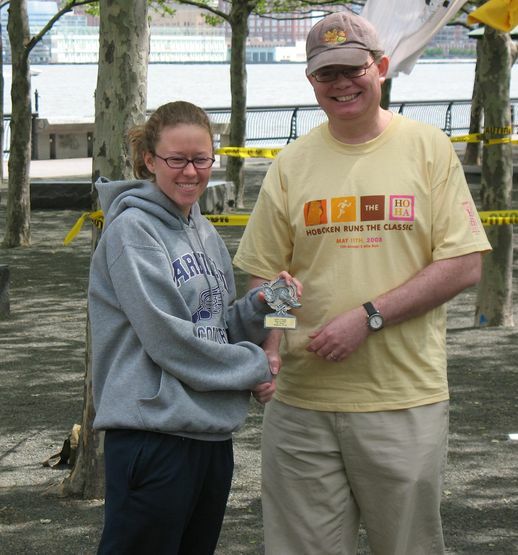 Meghan also received a trophy for her efforts. 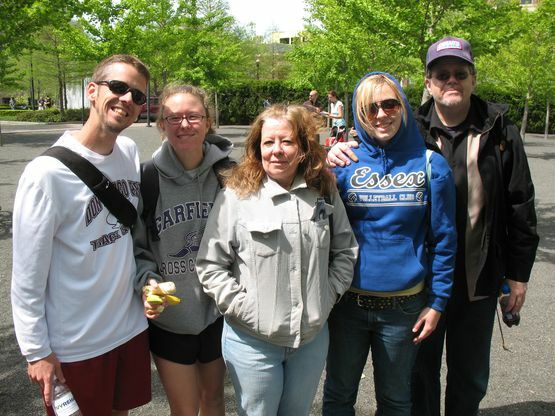 It was great to spend some time with the Garfield contingent this morning. Everyone seemed healthy and happy. Rob and Meg gave me a ride home with everyone headed back to Garfield. I came home had some coffee and read the papers and I’m content. A very low key day is just what is needed at this point. No complaints, no stress. And here are some snaps from this morning’s activities. See you tomorrow…. This entry was posted in the day after yesterday and tagged Cory, Elaine, Frank, Garfield Contingent, Hoboken, Juan, Meghan and Rob, Peter Coyote on May 11, 2008 by johnozed.